The Power Behind the Shield is You! As A Brave New World Guide, you've got a lot going on. You've got to come up with the adventures, keep track of all the extras, and get the action rolling. You don't want to be flipping through a rulebook just when things are getting their hottest. Power Shield is a colour full trifold screen that's perfect for hiding all your brave new secrets behind. Plus, the inside of the screen features all of the tables and summaries you need to run the game, all laid-out in an easy-to-reference format. No good Guide would be without it! 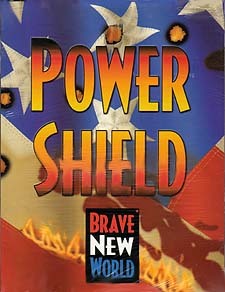 Power Shield comes complete with The Ripper, the first full-length adventure for Brave New World, the perfect way for beginning Guides to launch their first saga. It's a dark time in Crescent City. A serial killer known as the Ripper is hunting down young deltas and murdering them in the prime of their youth. The brutal deaths are making headlines everywhere, and the blame's falling square on the shoulders of the government-controlled press's favourite scapegoat: the Defiance. It's up to the heroes to track the Ripper down and bring him to justice. (With all the bad publicity the Defiance is taking from all of this, you can be sure that Delta Prime's in no hurry to get the job done.) The real trick, of course, is not getting killed by the Ripper in the process. Wish you heroes luck. They're going to need it.